352 pages | 236 B/W Illus. 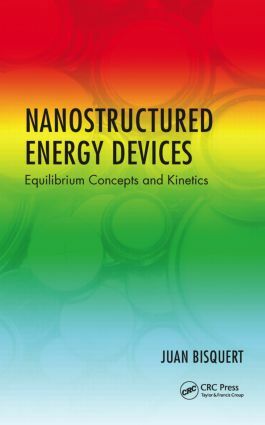 The first volume, Equilibrium Concepts and Kinetics (ECK), examines fundamental principles of semiconductor energetics, interfacial charge transfer, basic concepts and methods of measurement and the properties of important classes of materials such as metal oxides and organic semiconductors. These materials and their properties are important in the operation of organic and perovskite solar cells either as the bulk absorber or as a selective contact structure. Electrolytic and solid ionic conductor properties also play relevant roles in organic and perovskite solar cells. Juan Bisquert M.Sc. degree in physics in 1985 and the Ph.D. degree in 1992, both from the Universitat de València, Spain. He worked in the Universidad de Castilla-La Mancha, Albacete, from 1987 to 1992, and is a professor of applied physics at Universitat Jaume I de Castelló. At the beginning of his research career he worked in mathematical physics, in the field of relativistic quantum theory. His interests moved to the theoretical and experimental analysis of relaxation phenomena in solids and physical electrochemistry. He conducts experimental and theoretical research on nanoscale devices for production and storage of clean energies. His main topics of interest are dye- and quantum dot-sensitized solar cells, organic solar cells, perovskite solar cells and solar fuel production. He has developed the application of measurement techniques and physical modeling that relate the device operation with the elementary steps that take place at the nanoscale dimension: charge transfer, carrier transport, chemical reaction, etc., especially in the field of impedance spectroscopy, as well as general device models. The research interests also include related systems such as batteries, organic LEDs and bioelectronics/biofuels.